In Bermuda, you can start your Multicopter. Exceptions are botanical gardens and other government properties, as long as you have not obtained permission from the administration. If you only want to film landscapes, you do not need to get license as a private pilot. Approvals for commercial users are costly and take at least two months. Maximum flight altitude: The maximum flight height on the Bermudas is 120 meters (400 feet). Maximum horizontal distance and FPV: On Bermuda, your copter must always be within sight. Compulsory insurance: If you want to fly a drone in Bermuda, you must have an aviation liability insurance amounting to at least 1,100,000 BMD. Maximum take-off weight (MTOW): Drones up to a maximum weight of 20 kilograms are allowed to take off in Bermuda. Distance to airports: On the website linked below you will find a map showing the Bermudas no-fly zone. Other safe distances: There is a distance of 50 meters (165 feet) to people and buildings. Flight bans: Flights over populated areas are not permitted. Flight approval: Permits for flights on public government properties can be requested at (441) 236 5902. Time of operations: No information available yet. Regulations for commercial pilots: Commercial pilots must apply for an Aerial Work Permission. For this, you have to pay 3,200 BMD (around 3,000 euros), but you can get back a small part of it if the approval process brings less effort. The certificate itself costs 2,500 BMD. As part of the approval process, you must demonstrate your skills to representatives of the Bermuda Civil Aviation Authority (BCAA). You should plan for at least two months for the entire process. Once the BCAA has issued the permission, it is valid for one year and can be renewed for 500 BMD. 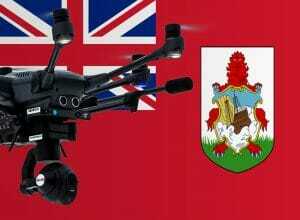 We have researched the listed drone regulations for Bermuda to the best of our knowledge. We can not guarantee the correctness of the information. If you want to be on the safe side, please contact the competent aviation authority. Alternatively, you can also ask the embassy in your country for further information about the regulations. Please leave us a comment when you receive news and/or gain experience with your copter in Bermuda!